Roger Federer was back in fine form in his first grass court match of the season, defeating German Florian Mayer 64 75 in one hour and fourteen minutes to advance to the quarterfinals, where he will have a very tough test against Milos Raonic, the young Canadian Phenom. Federer made the transition from slow clay to fast grass as fast as he could, knowing that he was facing a Top 30 player and a very tricky opponent who has an unorthodox style. He displayed his wide array of shots in a fun contest that had fun rallies and incredible finesse play. The first set was very even but Roger finally broke through in the 10th game when he was up 5-4, to automatically win him the set. It was more of the same in the second set when in the 12th game Roger got the break to win the match, 64 75. Overall, I was happy with Roger's play. The transition from clay to grass is never easy at first with the vast difference in speed and playing style. Besides, Mayer is no slouch (he beat Rafa last year in Shanghai) and he already had match play on the grass. It was very nice to see Fed play on a fast court, since the last time he played on one was back in February in Dubai. The clay court season always feels too long, especially now with Indian Wells and Miami featuring such slow hardcourts, it basically feels like a clay court season from Indian Wells to the French Open. 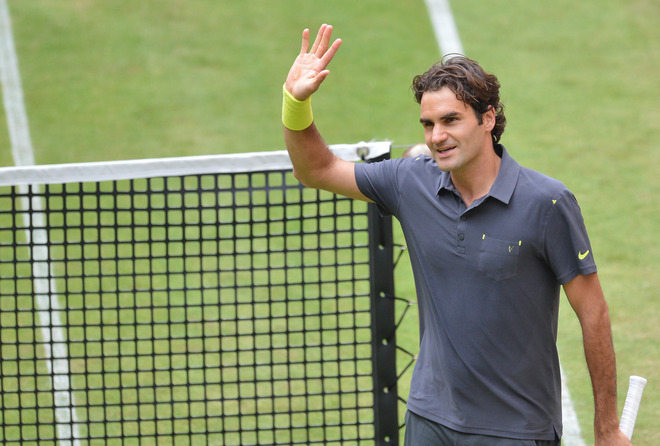 On a fast court like Dubai, Halle, and Paris, Roger gets to showcase his variety and his skill. They are the few surfaces where he gets to play like he did in his earlier years when he didn't rely as much on baseline dominance as much as all-out net-attacking 90's style tennis. I truly cherish these tournaments where Roger can let loose and be himself, instead of trying to adapt his game to beat elite defenders in long baseline rallies which does not suit his playing style. Anyway, in other action, Nadal defeated Lukas Lacko 75 61. It was a tricky first set for Rafa but after he got it in the bag there was little question as to who would win. Also, the aging veteran Tommy Haas upset clay-court specialist Marcel Granollers in straight sets 63 64. Granollers is #22 in the world. Last year's champion Philipp Kohlschreiber came through in 3 sets against Lukasz Kubot to advance to his 7th Halle quarterfinals. On Wednesday, Tomas Berdych, Milos Raonic, and Radek Stepanek all eased through their matches, while the #4 seed Alexandr Dolgopolov was upset by Mikhail Youzhny. Federer will have his hands full with Milos Raonic. Roger has beaten him twice this year, in Indian Wells and Madrid, but both encounters were very tricky affairs, especially Madrid. This fast Halle surfaces suits Raonic's big-serving game to perfection, but if Roger can successfully play him the way he has played all other big men throughout the course of his career, he should be able to edge by. If he does win, he will likely have a much easier semifinal match against Stepanek or Youzhny. Nadal faces Kohlschreiber, who loves playing in Halle and loves the surface. Rafa must be real careful in this one because Philipp is a very dangerous opponent. The 7-time French Open champion also might need to find a different way to beat him other than his attack-the one-hander strategy (that he employs so successfully against Federer) since the Halle grass is very fast and low bouncing. With Stepanek and Youzhny, take your pick. I pick Stepanek. In the Berdych/Haas clash, it should be one-sided. I love Tommy and he has been in surprisingly good form in recent months, but he should get demolished by the Big Berd. Federer vs Raonic and Nadal vs Kohlschreiber should feature some great tennis, so do not miss them if you can't help it! Both matches could very well go into a third set and both the matchups pose problems for the favourites (Federer and Nadal) that could see them upset.